Alfie received his first birthday pressie yesterday and I couldn't help myself, I HAD to let him use it straight away. I spent some time prevaricating about the need for a cosy toes type solution to winter freezes now young Alfred is out of his pram and into a lightweight buggy. It is all very well saying that he'll be OK in a coat, but if it were me, and I were out on a winter morning sitting in a canvas seat, I think I would want to snuggle up under something warm. So what's the problem woman? Just go out and buy one! Yes I know, it should be that easy, and yes I know I'm talking to myself now. The problem is that most of the snuggle bags on sale only go up to 18 months, and if you've been paying attending that means it'll only be useful for one winter. Which isn't great value for money when these things cost an average of £50. As always in these things, if you are looking for a solution that involves engineering, look to the Germans. In this case because they make these which deal with the problem of what happens when your child gets a little too big and a little too muddy with a foot flap at the bottom. So obvious it makes me want to take one to the manufacturers in this country and smack them liberally around the head with it. Not that it would be an entirely negative experience, I imagine a little like being happy slapped with a Care Bear cloud in fact. Anyway, Alfie went on his morning walk in his newly kitted out buggy and I think it's safe to say he felt snuggly warm in it. For those in Gibraltar it was about 10o this morning, and that stripy thing you can see around his neck, is not a scarf, it's a JUMPER. 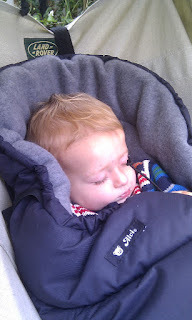 Yes my child was out in only a tee shirt, jumper and polar grade sleeping bag. I know, anything could have happened! Hypothermia was barely avoided: Small birds were falling from the sky frozen in mid flight. We call it Autumn round here and we survive it every year, so don't fret. So Alfie would like to say a big, snuggly thank you to his Grandma Lydia for his birthday present. On a completely different tangent I was sifting through some books in the canteen at lunch today and I came across a just stunning paragraph in Nigella Lawson's Kitchen which made me want to stand up and whoop in agreement. "I know a lot of good parents who never give their children food with salt or sugar, and this recipe (among others) proves conclusively that I am not one of them. Oh, and on top of these dietary failings, the following also contains alcohol. There's really not much to be said by me if these infractions offend." Nigella, my love, I am with you 100%. Edited 15/10: I was thinking as I was running this lunch about why I love this intro to her Teriyaki Chicken so very much. I decided it is because it is SO unapologegetic about the reality of being a parent, and embraces the idea that children don't have to fed exclusively on a diet of healthy. As a family we try very hard to eat a balanced healthy diet. It is something we believe very firmly in, and we do everything we can to ensure that Alfie gets to try a great variety of wholesome foods. Do we get chips from the chippy down the road. Errr, yeah. And does Alfie love them more than life? Course he does, and so do 90% of the children in this country. I love that she admitted her own reality in print. That rocks my boat! Thank you for not making me feel like a guilty mum Nigella.